Because XPB bullets are all copper, they're longer than lead-core bullets of the same diameter and weight. That tends to result in greater bearing surface, and requires unique loading data. Barnes has a new handloading manual including data for XPB bullets. Handgunners who like the predictable performance of Barnes' all-copper XPB bullets will be happy to know that extensive XPB reloading data is now available from Barnes in its Reloading Manual Number 4. Both the XPB and earlier Barnes Reloading Manual Number 3 were introduced back in 2001, but loading data for handgun bullets didn't make it into that manual. Instead, Taurus marketed 20-round boxes of "Advanced Handgun Cartridges" loaded by PMC using Hodgdon powder and XPBs, which the company called the "Hex Bullet." Clearly the idea of an all-copper handgun bullet that expanded reliably and predictably and that retained most if not all of its original weight was a success, as Barnes expanded the XPB line, and by 2006 it included bullets for calibers ranging from .380 Auto to .500 S&W Magnum. Because XPB bullets are all copper, they're longer than lead-core bullets of the same diameter and weight. That tends to result in greater bearing surface, and requires unique loading data. For example, you can't simply take your pet .40 S&W load that uses a 155-grain jacketed lead hollow-point bullet and switch it out with a Barnes 155-grain XPB. In fact, you shouldn't switch those components and start working up a new load from suggested minimum, either, as I found many instances in which the starting load for a jacketed lead bullet exceeded the maximum load for the same weight XPB. Until recently, loading data for XPB bullets was limited to little data sheets included with a box of component bullets. There is also a good amount of data on Barnes' website, and members of the Barnes "Copper Club" receive new data as soon as it becomes available. But Reloading Manual Number 4 ties all of the current XPB loading data together in one place. As you'd expect from a new manual, there's a lot of new and updated data. For example, I have an early box of .40-caliber 155-grain XPB bullets with a little data sheet indicating only two loads. In Manual Number 4, there are four .40 S&W loads for that bullet. And for the 185-grain .45-cal XPB, the little data sheet also has only two loads for the .45 ACP, but Manual Number 4 boasts six. XPB bullets were once offered as loaded ammunition by Taurus. Data came on little data sheets with component bullets. Now extensive data can be found in Barnes' newest handloading manual. I found it interesting to note that some of the maximum loads from the data sheets are throttled back in the new 673-page hardbound manual. There are also variations between the old data sheets and the new manual regarding cases and overall lengths, which may account for the different data. That is not to suggest Barnes' new manual is "lawyered down." Indeed, many of the new rifle loads for the TSX and MRX bullets are hotter than the data for original X-Bullets from Manual Number 3, and the new data for the 275-grain .500 S&W Magnum indicates maximum loads with velocities significantly higher than Federal factory loads using the same bullet. 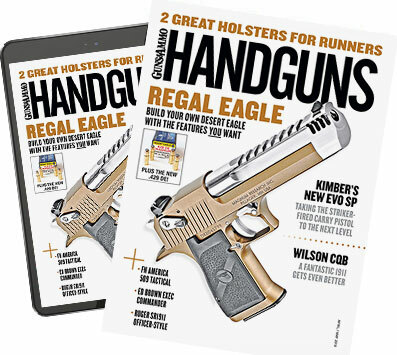 Barnes Reloading Manual Number 4 isn't all high-performance handgun loads. There is extensive ballistics information and data for muzzleloaders and centerfire rifles. I'm always saddened to see cartridges dropped from loading manuals, and this one is no exception. Perhaps the .500-416 Nitro Express won't be missed by many, but gone are old favorites such as the .22 Hornet and.250 Savage. The up side is that their omission makes room for new cartridges including the .375 Ruger and the various short and super short magnums, and some of the odd ducks such as the .338 Scovill and .500 Jeffery remain.